DC’s Cocktail? 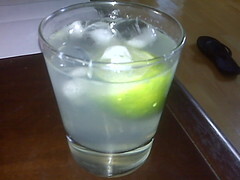 The Gin Rickey? I didn’t know what a Gin Rickey was this morning, or ever where it’d come from, until I came across the story on WTOP about the DC Craft Bartenders Guild (who desperately need a website.) who had a Gin Rickey contest this week. What was fascinating wasn’t just the Rickey itself, it was the intense debate on the Yelp listing comments on the differences between the Rickey and a Gimlet, which are largely comprised of the same ingredients (Gin & Lime juice), but the differences lie in the subtletly of creation. Turns out, the Gin Rickey is steeped in DC tradition, going back to 19th century lobbyist Colonel Joe Rickey. Once the owner of the Shoemaker Bar on Penn Ave here in DC, Rickey’s drink of choice was gin or whiskey, over ice, with the juice of half a lime, and, if he was feeling peckish, a little sugar, with soda water. The Post has the scoop on the winning entry, which is a black pepper Rickey. Read on for the video from the context. Fascinating to me, though, was Rickey’sobituary in the New York Times from 1903. He’s listed as one of four colonels that were known in any city in the US. How awesome is that? Just four retired military guys who were instantly famous and recognizable. That just doesn’t happen anymore, does it?